In the late 80's the world of action figures got a little wacky when a small company called Playmates Toys decided to release a group of figures based upon an independent black and white comic book. In the book, a Ninja Master lives in a sewer along with his four pet turtles. One day an evil enemy known as Shredder pours a strange goo down a man-hole to kill him but instead turns his pets into humanoid animals and him into a large humanoid rat. The Ninja Master (called Splinter) has trained these four teenage animals (named after his 4 favorite Renaissance artists - Michaeangelo; Leonardo; Donatello; and Raphael.) in the art of Ninjitsu and they use their skills to combat evil as the Teenage Mutant Ninja Turtles. The book had a cult following and in 1986 somebody decided a toy-line and cartoon (which would be more kid friendly then the edgier and serious black and white comic book from which they sprung) would be a perfect way to flesh them out. The TMNT (common collector's acronym)were a stark contrast to the current lines of popular figures which had serious story lines. The turtles were wacky, practically comical in their attitude (complete with surfer jargon, and a love for pizza and partying) and this made them a huge success throughout the late 80's and early 90's. It marked in a new type of action figure era, the era of the wacky animals. To longtime fans of the comic, this new line was a watered-down version of the book characterizations made to appeal to kids. Of course the kids couldn't care less and instantly began buying up every figure and related product which had the four green teens' faces on it. Who could forget the return of the word "Kowabunga" (an old surfer term originally popularized by Chief Thunderthud on the Howdy Doody show) to the nation's vocabulary? What products bore the likeness of the Toxic Terrapins? What products didn't? After the initial release of the first four figures it seemed everything from pillows to cereal, as well as three live action movies, had the four turtles' faces on them. You couldn't get away from them no matter where you went. The main draw was of course the toys. Figures of the four turtles and their friends (like April O'Neil; Mondo Gekko; Ace Duck; Wingnut; and Usagi Yojimbo who had his own independent comic book) and the villains (Shredder; Krang; Beebop; Rocksteady; Ground Chuck; Baxter Stockman; and the Scmbug) sold out nearly every time they got put out on the shelves. The four turtles would see the most variations of any figures at that time. There were over 150, with everything from Headdropping Turtles to Star Trek Turtles. Fans had quite a few versions of their favorite mutant teenagers to choose from. You can't forget the vehicles that came out such as the Party Wagon; Turtle Blimp; Ninja Grappler; and other strange and wacky things for the good and bad guys to drive. It seemed like you couldn't escape the phenomenon but, like everything else, nothing lasts forever. Especially in the world of toys. In 1993 a line called Power Rangers burst onto the scene and while the TMNT line continued on, it never reached the fever pitch it had in the early 90's. In 1998 it was decided the line needed a revamping. Fans were given a new live action show, ironically made by Saban entertainment whose Power Rangers show and toys kicked the turtles out of the top spot, and a new name - "Ninja Turtles, The Next Mutation", and the toy line was created. Despite their best efforts (including adding a new sister turtle called Venus De Milo) it just didn't do well and got cancelled after a short lived second season of toys. There had been such a glut of the original line that the new line just wasn't accepted by the fans. The era of the wacky animals was over after a nearly 10 year run. Today, the figures haven't appreciated much in value. Like the Masters of the Universe before them, they were so mass produced you can still find them just about everywhere on the secondary market and in flea markets for very little money. 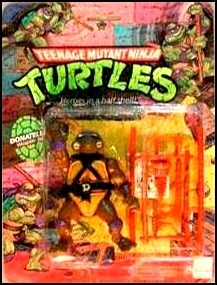 Mint on card figures, however, are just now beginning to come up in price, with the most expensive being the figures of the four turtles from them first season. The fab four can bring $25 to $40 dollars each. Also gaining value are figures like Leatherhead, the evil cajun gator man, (who was pulled from the line after his release in '89 because he didn't sell) and the '90 April O'Neil, the reporter with the "press" badge which gained infamy after a rumor got started that parents complained kids were pressing on her breast because they thought that's what the badge meant. The truth is they got rid of it because it was too expensive to keep the "press" paint job. The rest of the line of whimsical figures have yet to increase dramatically in value but there is no doubt that when the children who made the TMNT so popular grow up, they will once again take another trip to the sewer to get reacquainted with those Ninja-fighting, pizza-eating, mutant teenage turtles.